TEC Mold Holdings Limited specializes in plastic injection mold and molding market since 2000. We now develop to an ISO 9001 & TS 16949 certified company with 3 mold manufacturing facilities and 1 injection molding facility covering 50000 sq meters, which is owned by ourselves, and a total workforce of 650 people, honored with the title of “China Hi-tech Enterprise”. Now TEC Mold consist of 4 divisions: Large Mold Facility, Precision Mold Facility, Injection Molding Facility. Each shop is equipped with a advanced facilities imported from Germany, Japan and Switzerland, like high speed CNC(Deckel MaHo), EDM wire cut machines(Sodick) and precise EDM(Charmilles). With independent teams of project management, engineering and manufacturing, backed up by the same undivided administrative and financial teams, each division focus on its specialty to provide the best quality. The company has strict training system for all the staff to ensure the proper operation by minimizing mistakes, which give the best guarantee of lead time as well. Quality control for all our products and components is critical and we believe in “Quality above everything” for which we continue to invest in the best resources for processing. 2003 TEC Mold invested in 5000㎡ mold shop and obtain the ISO 9001:2000 quality system certification. 2006 Manufacturing capacity increased by adding an additional 5000㎡ workshop and setup a dedicated Injection Molding shop. 2008 TEC Mold acquired additional machinery imported from Germany, honored with the title of "High-Tech Enterprise of Shenzhen". 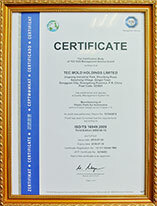 2011 Achieved ISO/TS 16949:2009 Automotive Quality Certification. 2012 Awarded "High-Tech Enterprise of China". 2013 TEC Mold acquired a 42000㎡ Industrial park in Dongguan City. 2015 Precision Mold Shop-Dongguan Division is inaugurated. 2017 Audio Business Division is inaugurated,adding secondary assembly capabilities for the premium audio industry. A respectable and innovative industrial leader. Create value for customers,offer opportunities for staffs,bring benefits for shareholders,take society's responsibility. How does King's team manage the project? ?12 project engineers English fluently, and work in the mold industry for many years, has a wealth of mold knowledge, can be accessible with our overseas customers to communicate project issues. How does the customer monitor the project?
? Telephone and mail communication: Jingrong's sales team and project team are fluent in English and can communicate with the customer in depth.
? Project documents: We have a variety of project documents available to customers, such as weekly project schedules, size reports, injection parameter tables and so on.
? Picture: Weekly project schedule is also accompanied by a photo photo to the customer. TEC is committed to providing customers with better after-sales support, when the product reaches the destination country, our after-sales network (ASSN) will provide follow-up services. With our strong after-sales service network and overseas Jingrong factory combination, we can provide engineering changes and repair and other services. Our global network has 15 service providers and will increase to 26 in the coming months. In addition, our overseas plants will also provide services this summer in the United States (Detroit), the fall of 2016 in Mexico (QRO) and the spring of 2017 in Germany.